For the first time, Albertans with disabilities will have a dedicated advocate to help them resolve issues, find supports and promote inclusion. Community and Social Services Minister Irfan Sabir with Alberta’s first Advocate for Persons with Disabilities, Tony Flores (second from left), and other important partners. Tony Flores has been selected as Alberta’s first Advocate for Persons with Disabilities. He is a self-advocate, international para athlete and has extensive experience working with people with disabilities. In his role, Flores will support children, youth and adults with varying abilities by raising awareness of their rights and the services available to them and their families. 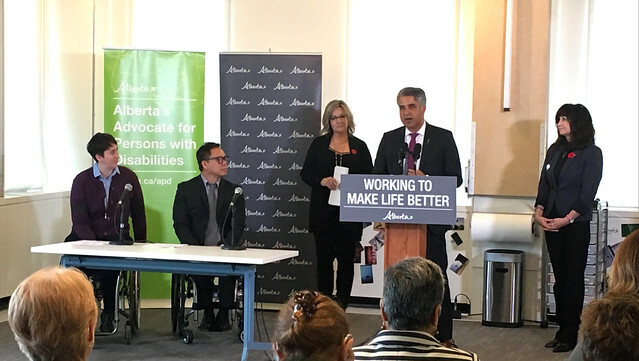 The Alberta government invested $1 million in Budget 2018 to establish the Office of the Advocate for Persons with Disabilities. The office, led by Flores, will officially open in mid-November. Alberta’s new Advocate for Persons with Disabilities was selected after an open competition process. More than 1,300 Albertans with disabilities, families, service providers and support organizations provided input on the role, responsibilities and top priorities for the advocate’s first year of work during public consultations last spring. Flores has a bachelor of arts degree in economics and political science with extensive personal and professional experience working with people with disabilities, their support networks and stakeholders. He is a self-advocate who believes strongly in empowering people with disabilities to reach their full potential and looks forward to being part of a team that will focus on improving the quality of life for people with disabilities. Flores is an accomplished athlete, has extensive experience working with a non-profit organization and has volunteered – both locally and internationally – mentoring and coaching athletes with disabilities.